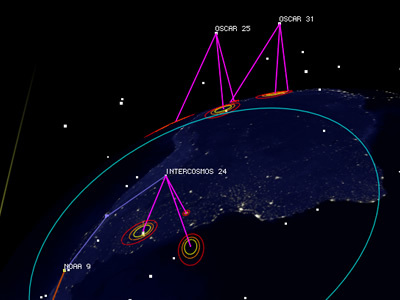 Freefall puts the wonders of satellite exploration at your fingertips, simulating the flight path of more than 850 actual satellites Global Positioning Systems, GOES, NOAA and other unclassified orbiters used by amateur radio stations, weather services, search and rescue teams and more. This powerful MAC OSX screensaver has a 3D viewer which interacts directly with the simulator, allowing control over dozens of preferences and perspectives. You can turn any geographic location into a ground link and watch satellites fly by each location, or choose from a database of over 28,000 cities or define your own using latitude and longitude. You can even see detailed information about each satellite including altitude, speed, coordinates, launch data, and mission background. All satellite data can be automatically updated daily via the Internet. 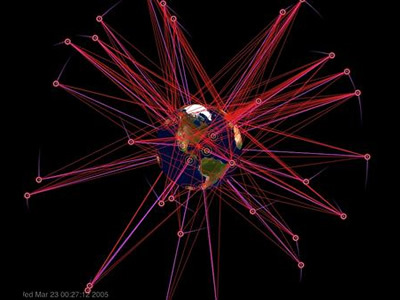 As an example, the first image shows all the GPS Satellites (with tails, sensors, radio links, etc).